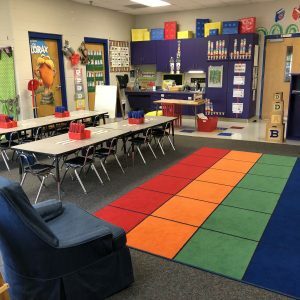 Don’t you just love seeing other classrooms? Our principal really encourages us to throw out (or donate) things we don’t use anymore. 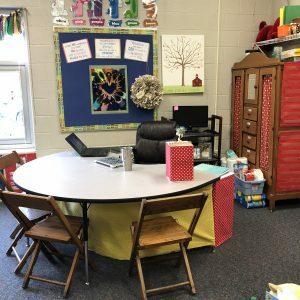 Having a clutter free classroom is essential for student success and your sanity! A couple of years ago I got rid of SO MUCH stuff in my room that all of my coworkers felt sure I was leaving my school. It wasn’t the case, but once you get started decluttering, it will become a little contagious! 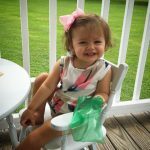 I started watching my kids. I noticed that they hardly played with a kitchen set during indoor recess so I donated it to a local church in need of one. I sent a stuffed animal home with every single child! I had bought those thinking they would be good book buddies but I realized they were just taking up valuable learning real estate. You get the picture. Get rid of things your students no longer need or use. 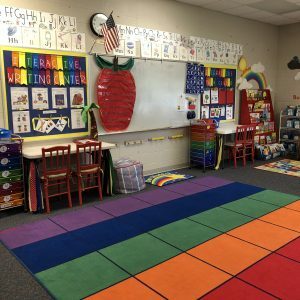 My principal had us walk around and vote on each others classrooms for a variety of awards from most colorful, to most inviting, to most organized. There were lots of winners. She gave out $5 Sonic gift cards but it was so nice to see what other rooms in the building look like. We just don’t have time to see them all! This picture was taken after I’ve used them for over a year and I still love this set up. It makes it so easy for me to find the activity I’m looking for. I bought these little supply boxes for 48 cents a piece at Walmart. You’ve got to love that price. 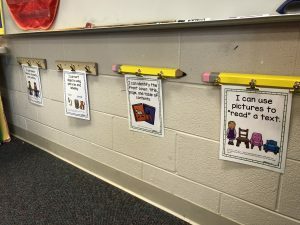 They are sturdy, last a whole year in the classroom, and then I send them home with each student at the end of the year. Each child puts a box of crayons, a pair of scissors, and 2 glue sticks in his or her box. 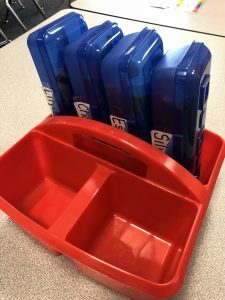 I put each student’s name on them and then we place them in these red organizers I found on Amazon. 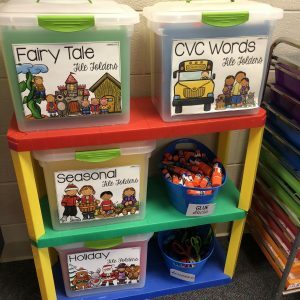 Later in the year, I can use the other side of the organizers for whatever I need the kids to have access to. 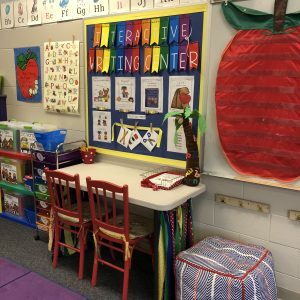 We have always shared our supplies with the whole table, but I grew so tired of some students peeling crayons or chewing on them. Others would purposefully break their pencils. You don’t have to worry about this when they have individual supplies! Ignore those supplies behind my table! Still sorting! The 2 pictures above show you my work area. The longer I’ve taught, the smaller and smaller “my area” has gotten. 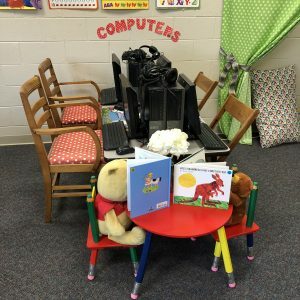 I ditched the desk a few years back and keep my teaching materials in that dresser with the red polka-dot fabric. My assistant hot glued the yellow fabric underneath the table to cover up any messes that might occur there. I love this set up. I can pull a group of kids to my table, test them with ESGI or work with my small groups there on reading or math activities. It just makes so much more sense to have a kidney table then it does to have a desk. Speaking of ESGI, it has made a huge difference in the way I organize my assessments and communicate with my parents. It is super user-friendly. I am still meeting with the students to test them one-on-one which I love, but I can immediately print out individualized parent letters and even flash cards for the items they miss. The folks at ESGI are so sweet and helpful. Right now you can get a free 60 day trial and gain full access to all of ESGI’s features. You don’t have to input credit card information to try it which is huge for people who are worried about forgetting to cancel something. If you decide to purchase it, you will get $40 off with the code “pigtails”. Use that code now to sign up for the free trial by clicking here. You will also be entered to win one of ten free $50 Amazon gift cards or one lucky winner will win a $500 gift card! Oh the things I could purchase with that! Click on the ESGI screen below to head over and grab your free trial! 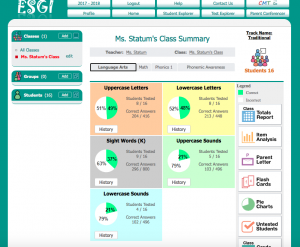 If you want to learn more about how I use this assessment software in my classroom, type ESGI in the search box and you will find a recent blog post about it! Can you tell I have a thing for collecting vintage chairs yet? My mom is so good at recovering them with a cute fabric and the kids love them! 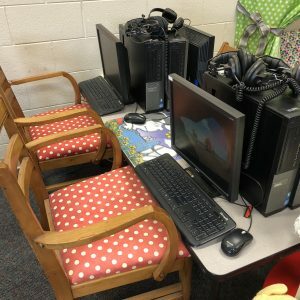 The biggest change here is that I moved 4 computers spread out across 2 of these tables onto 1. We gained so much room! I loved this easy change! See the little table and chairs? I grabbed those at Hobby Lobby. When I started teaching 11 years ago, my sister Heidi suggested that I stick with primary colors. I have NEVER regretted that decision. 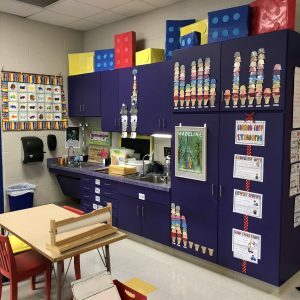 It makes my classroom colorful, I can ALWAYS find the totes, name tags, supplies, etc I need, and I have never gotten tired of this color scheme. 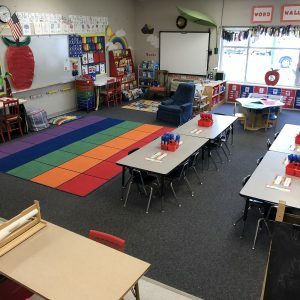 I know there have been some adorable themed classrooms on Pinterest lately but make sure you pick something that will last! 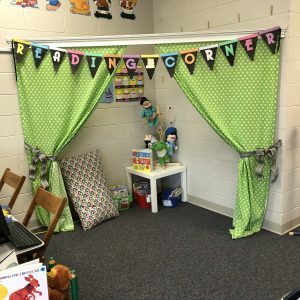 I LOVE this new reading corner. My friend Michelle was moving to third grade and graciously donated this to my classroom. I have a few puppets here that my students can use to read a book with. I am planning to fill out a Donor’s Choose request for a comfy bean bag chair for that area on the right. This is one popular area during indoor recess. 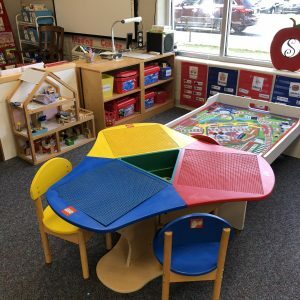 My sister donated this Lego table to my classroom a couple of years ago. Everyone loves it. The center holds Legos. 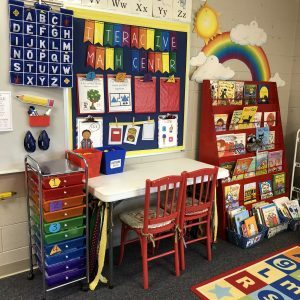 (Notice how the primary colors work perfectly with my classroom “theme”!) I put an inexpensive rug on this train table to spruce it up. 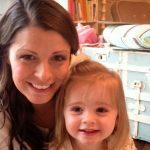 When I was studying what my kids played with the most, I realized a train table, Lego table, blocks, and a dollhouse were at the top of the list for kindergarten! I have 19 students this year. We have 5 kids at each table except for one. This is a view of my 2 Interactive centers, my white board, and my rug. I filled out a Donor’s Choose request for this beautiful rug a few years ago and it was funded. We love it! If you have not read about my Interactive centers, click on the photo above to watch a two-minute video preview. 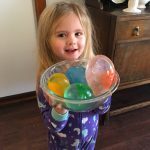 They are lifesavers in the classroom! 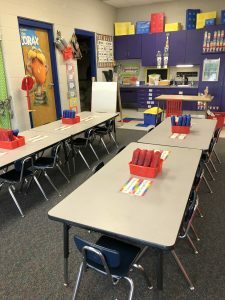 They help us stay so organized and we love having centers where my young k kids work independently giving me valuable time to meet with my small groups! I REALLY love my little library area. I spray-painted this display shelf red and like how cheerful it makes my room look. I prefer having my books organized in baskets by author/theme. 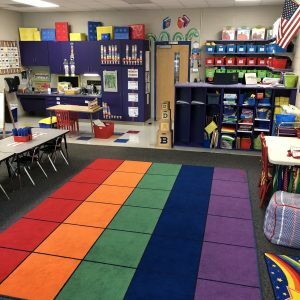 I often tell students to sit on the “ABC” rug if we are going to watch short videos or dance with Go Noodle. I was so sad when I had to take my Curious George off the wall in the corner of this classroom. Do you remember him? Our former art teacher, Mrs. Soozie, had surprised me with him and a fabulous tree. Unfortunately the fire marshall was not a fan of the materials. 🙁 Some of my kids were in tears when I took him off the wall! We are so fortunate to have these beautiful cabinets to hold our supplies. 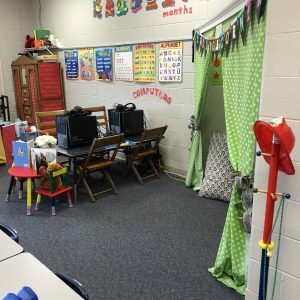 Believe me, I have been in some tiny rooms with no storage and 23 5th grade students. 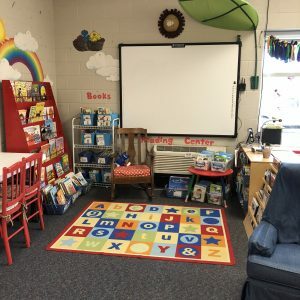 I feel grateful everyday when I walk into this large classroom with so much storage! This is an example of what a completed and semi-completed math ring tower would look like. 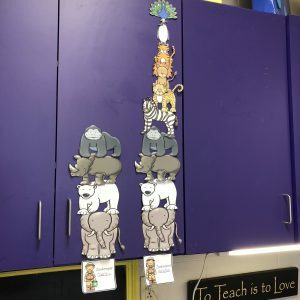 Since it is August, my students haven’t started building their “zoos” yet. Click on the photo above to watch a 2 minute preview about the “Zookeeper’s Math Ring”. 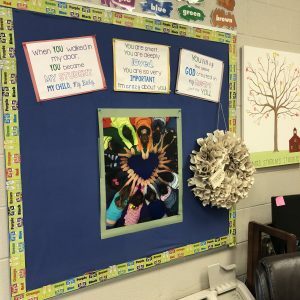 It is a unique math system that I came up with that teaches students their math facts for the entire year. You will love it! I like to hang our objectives from these rulers and pencils I grabbed in the Dollar Spot at Target. 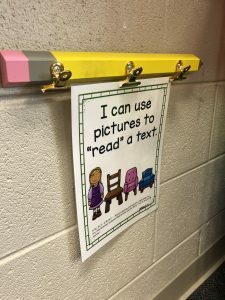 I created these when we switched to the new TN standards. 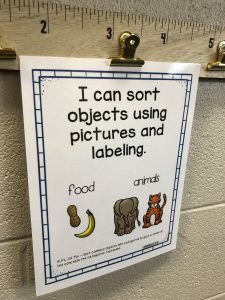 I wanted to use a kid-friendly “I Can” statement at the top, a colorful picture, and the detailed and complete “teacher version” of the standard at the bottom in a small print. We love these. 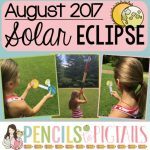 Grab them for your classroom by clicking on any of the photos above. I have them for math and ELA for kindergarten and first grade Common Core or TN standards and I’m about to add the Kindergarten Science standards for TN teachers or teachers using NGSS later this week! 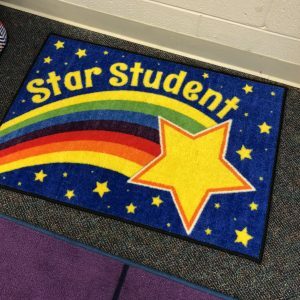 My friend Michelle also gave me this “Star Student” rug and this great idea. In the morning, I look for a student who came in quietly, was helpful to others, and finished their morning work. That person gets to sit on this place right in front of my reading chair on the rug and be the line leader. It really helps with morning routines! Do you know about my obsession with folder tasks? I LOVE them! When I moved from teaching 5th grade to kindergarten, I had another teacher give me a box of them. I LOVE using them so much that I’ve created hundreds of folder tasks you can find in my store. Guess what? You can grab the tub labels above and a free folder game by clicking on the photo above! 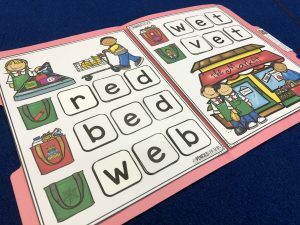 If you sign up for my newsletter from this blog, I will also email you a free CVC words folder game and a freebie once a month! This is the game you receive for free when you sign up for my newsletter! 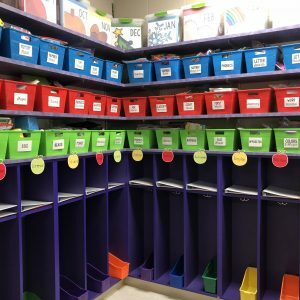 I hope you’ve enjoyed this tour of my classroom and that is has inspired you to get organized! I am amazed, Hillary. What a wonderfully organized oasis to come to when many of our kids come from places of chaos and disruption. You are a jewel and such a role model for young teachers. Thank you so much Mrs. Morris! That means the world coming from you! You have done a lovely job for the little ones. So proud of you and your teaching ability. Thank you so much Mrs. Simmons! I really appreciate that!